Meryl Streep, Julia Roberts, Ewan Mc Gregor, Julianne Nicholson, Juliette Lewis, Sam Shepherd, Margo Martindale, Chris Cooper, Benedict Cumberbatch, Abigail Breslin, Dermot Mulroney, Misty Upham. 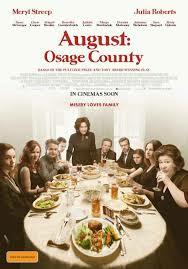 August in Osage County is very hot, which does not do very much for people’s moods. And the moods in this film can be sometimes quite grim, often angry, and manifested in bizarre behaviour and a barrage of coarse language. It is not the most cheerful of family dramas, but is fascinating in a morbid kind of way. When Beverley disappears, Vi becomes anxious. At home she has to rely on one of her three daughters, Ivy, Julianne Nicholson, whom she treats with some disdain. She relies much more on her sister, Mattie Fae (Margot Martindale) who is something of a hard case as well and harbours a family secret. Coming on to the scene is the oldest of the three daughters, played by a gaunt-looking Julia Roberts, perpetually angry and contributing mightily to that barrage of language. She comes with her husband, a rather meek Ewan Mc Gregor, although it emerges that they are separated. They bring their daughter (Abigail Breslin) who has torn emotions about her parents and is experimenting with drugs. so, plenty more ingredients for difficulties as the family prepares for the funeral and comes back after the funeral for that eruptive meal. Also in the mix is another daughter who has stayed away from home for a long time. She is played by Juliette Lewis, rather naive, a bit on the outer, with her latest boyfriend, Steve, Dermot Mulroney, tagging along. Perhaps this could be called a film that is more interesting rather than entertaining, although it is fascinating to watch the ensemble cast and their interactions. This is a highly dysfunctional American family. Not that there haven’t been many films with this theme, but here it is portrayed both seriously and comically, deadly secrets which can ruin people’s lives, attempts to deal with harsh realities and generally not succeeding. 1. The impact of the film? Spending so much time with such unlikeable characters? 2. The transition from play to film? The set pieces, the dialogue, the opening out for trips to town and church? The meal sequence? The musical score? 3. The atmosphere of Osage, Oklahoma, the planes, flat, the terrain, the town, the homes, the church, the heat, the ethos of Oklahoma? 4. The strength of the cast of performances? 5. August, the heat, the characters in the heat, the reactions to the heat, the effect of the heat, of the weather? 6. The introduction, Beverley, the angle from which was photographed, talking to Johnno, employment, her being a Native American, her care of Vi, her medical history, the background of the marriage and the relationship, her pills, cancer, drinking? His quoting T.S.Eliot, the background of the marriage, as a husband, father, three daughters, his affair, Little Charles, his poetry and awards? His leaving, the note, the boat, the money issues, his death, the focus of the funeral? 7. Johnno, her background, Native American, her role for care, cooking? being insulted? Appreciated? Her listening? Slapping Steve? The end and the Pietà? 8. Vi, Meryl Streep’s performance, the matriarch, her age, history of illness, her cancer, continued smoking, the treatment and her hair, the wig and its impression? Being harsh, high on drugs? Gratitude, language, despising of Johnno, a severe mother? Her marrying Beverley, love for him, his affair and her knowing about it? Her relationship with her sister? Contrary, crass, her prospects, life and death? 9. Ivy, at home, her relationship with her father, and not being appreciated, her mother looking down on her? The discussion about relationships, her secret love? The revelation about Little Charles? Her relationship with her sisters? Love, plans to go to New York, revealing the plan to others, the revelation of the truth, the effect on her, the sad sister? 10. Beverley’s disappearance, contacting Barbara? Barbara and Julia Roberts? A rage, relationship with her mother, early leaving home, academic career? Her father’s pride in her? Her marriage, the years, her husband’s affair, the breakup? Covering up in coming to the funeral? Her relationship with her daughter, her concern about her? Rough manner, the language, the relationship with her sisters, the discussions? The arguments, the talks with a husband, with her daughter, and about her daughter? concerned? The church in the ceremony? The ups and downs of her moods, her concerns, her arguments? 11. Barbara and her toughness, the importance of the meal, eating, at the end of her tether, the attack on her mother, the fight, the end and her walking away? Her mother in the field? 12. Barbara’s husband, seeming nice, care, driving the car, with their daughter, the truth about the separation, his driving them to the funeral, around the town? Going to the shops? The situation with Jean, the drugs, with Steve? 13. Karen, her being away, brash, manner of talking, naive? The men in her life? Steve, bringing him, her surprise? His behaviour, talking with Jean, alcohol, the drugs, Jean accepting them, with him, the sexual approach, her reaction, Johnno and her attack on Steve? His being ousted? 14. At the church, hot, the ceremony, the clergyman, the effect? The tribute to Beverley? The variety of reactions from the family? 15. The build-up to the meal, the staging of the meal, the length within the film, what was said, how it was said? Truth and lies? Secrets? Deceit? Hurt? Physical attack? The possibility of catharsis or was the family not tragic enough? 16. Mattie Fae, Vi’s sister, taking sides, dominating her husband, ridiculing her son? The attitudes of her husband, placid, at the table, anger underneath? Whether he knew the truth about his wife and Beverley or not? A decent man, relating well to his son? Supporting him against his wife? His telling his wife the truth? 17. Little Charles, reputation, late, the bus, his excuses, the bond with Ivy, at the table, his being humiliated? His love for Ivy, the revelation about the truth and his father? 18. Vi, knowing the truth about Charles, Mattie Fae and her revelations and fears? Vi’s attitude? 19. Vi and her condition at the end? Her daughters leaving? Barbara, alone, driving the car? Vie in the field? 20. Human nature, the goodness of human nature, yet the malice, as demonstrated in this most dysfunctional family?